I can’t recall when I became a dispassionate passerby. Hundreds of street walks ago it must have just happened. The cliché panhandler, after all, is any city’s token, much like the corner Starbucks. Distressed faces and bodies wrapped in soiled covers have long failed to induce my sincere heartbreak. Because it isn’t me, and it isn’t those I love most. Because my wallet doesn’t supply infinite dollar bills to every pleading voice I hear. And so, my aloofness, what I imagine resembles a trotting saddlebred with blinders on days when I speed-walk to work, is likely the reciprocal cliché to those who call the streets their home. 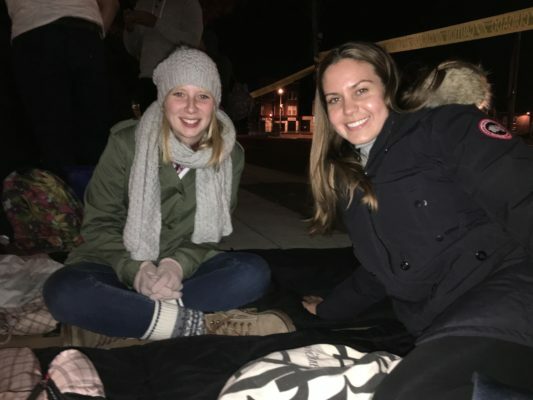 On November 17th, when the overnight temperature dropped to 45 degrees with a light breeze, I slept outside with Greta Geilhardt and ISH board member, Linda Harper, through Covenant House’s annual event that brings awareness to homeless youth. Except, well, that I couldn’t sleep for a single minute. The concrete proved ruthless, and my feet refused to warm up. Sounds of chatter, whizzing cars, screeching engines, and heavy vehicles that sent shock waves through the ground, made my night a tossing and turning match. I should mention that we had security watch over us all night — not so much a luxury afforded in the real world. At around 2am, with three hours left to go before the Covenant House “wake-up” call, I began to feel aggravated and stuck, with no choice but to endure the remaining hours. How can somebody go through this for nights and days? Nobody should have to. Without luck shutting my eyes, I began to observe my passerby; the vehicles speeding along New York Avenue. Almost always I noticed their heads turn in curiosity at the sight of rows of homeless-looking bodies sprawled outside Covenant House. It occurred to me that they couldn’t see my face. They didn’t know anything about me; my age, where I grew up, my family’s background, my dreams, my hopes, my failures, worst struggles and fears. To them, I was that cliché homeless person buried under layers of clothing inside a sleeping bag. And every single day, I am them, the dispassionate passerby. 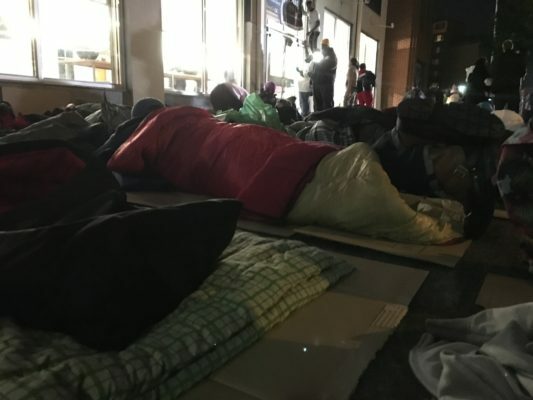 The Metropolitan Washington Council of Governments counted 8,350 homeless individuals in the District of Columbia this year, a rise of 14 percent from 2015. The increase is attributed primarily to a spike in family homelessness, many of whom are teenage parents. It is an estimate at best because, as I learned, homelessness comes in unaccounted for types such as couch surfing. We listened to a panel of young men who endured lives of poverty, abuse, neglect and violence that led them through the doors of Covenant House. As one speaker pointed out, he continues to wear the label long after he ceased to be homeless; a stigma that has taken him time to admit and accept. The most striking revelation for me that night was how swiftly the youth agreed that mentorship is the greatest gift the community can give them. In fact, it is less about the lack of resources and money, than it is about the inability to see a path out. “If you give me a $1000, and I don’t understand what that $1000 dollars will do for me, I’m going to the corner store for ice cream,” one of the speakers said. It turns out that my treacherous five hours on the concrete was nothing compared to a man who spent five years on the streets with his young son when he lost his job after the Bush administration. He is well-spoken and tough-looking but his voice began to crumble as he recalled the days when a kind stranger provided food and came to check on him and his son, every single night. It’s only by God’s grace that they both survived, he said. My intuition was to ask what drove him to homelessness after his government job, and for so long. But, I didn’t, and it doesn’t matter. As is often said, talent is universal but opportunity isn’t. I saw that through the energy, ambition, and humility of the young men who spoke to us. They exude the type of strength and maturity only earned by overcoming life’s toughest trials. Shaun, a lanky athlete who dreams of a basketball career in the NBA was forced to drop out of high school. He is now completing his education with the help of Covenant House, is involved with basketball through the Alternative Education League, and hopes to inch closer to the NBA with the possibility of an athletic scholarship. “I’m still chasing my dream, and won’t give up now,” he said with fervor that gave me goose bumps. Jeremiah, a single dad, wants stability for himself and his young son, and hopes to set aside money for his son’s future education. Another young man is excited by the prospect to earn a business degree and one day become a corporate executive. My early morning that followed the sleep-out felt much like I had pulled an all-nighter. Which, essentially I did. Linda Harper kept me optimistic by earlier reminding us how comforting it feels to come home to a hot shower. That ability to walk away from a nightmare and live in safety and warmth again isn’t a given to each person, yet it’s safe to say that each person desires that escape. Covenant House told us to carry on with our day without taking naps to experience what it’s really like to hypothetically have to interview for a job or try to play a sport while depleted of energy. It hadn’t crossed my mind before how excruciating it must be to try to ‘seize the day’ under consistently compromised sleep. As I walked to work that morning, I noticed a woman pamper her plumb toddler outside a French patisserie on Connecticut Avenue. She was well-groomed and nicely dressed taking caution to wipe away her crumbs that trickled onto the child’s jacket. It had reminded me that the night before I saw a woman whose ankles were exposed because her pants were too short and her sneakers tattered. She carried a young girl, with chubby cheeks and gaping eyes of despair that mimicked her own. If there is such a thing as the lottery of birth, one of these children has already lost. It’s easy to deduce homelessness as a product of poor life choices, and the lack of hard work. But we don’t all start on an equal playing field. Few excel despite all odds. Most get left behind in a social system that wasn’t created to help them. I have no illusions that there is a silver bullet to eradicate an age-old and multi-layered problem such as homelessness. But, I have learned from some of the young men that there is tremendous healing power in ditching assumptions, breaking down social divides, and taking a chance on somebody without expecting something in return. As the house that cultivates future global leaders – those of us who will one day craft public policy, push the boundaries of science and technology, establish society’s laws, and yes, have the political clout to elevate a broken class – there might lie too much potential for us to be the dispassionate passerby.